After a really tough day yesterday, I was hoping we’d get a few more bites today. When I got there, it looked like the carp had finished doing their ‘business’ as they weren’t thrashing about anymore although I really didn’t know if this was a good or a bad thing as far as the fishing was concerned. 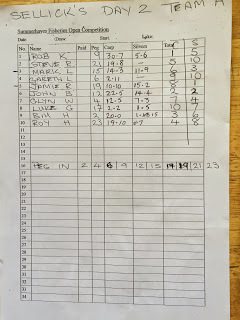 Glynn and Nigel were leading both the carp and the silvers and Ray and me were lying in second place in the carp and fourth in the silvers so we were in with a shout and just needed a decent draw. 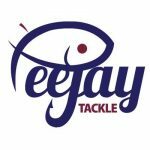 The anglers on Longs were called up to draw first and Ray came back with peg 18 which wouldn’t have been my first choice but Ray didn’t seem too worried. Then it was the turn of Sellicks and before I got to the bucket, Bill had pulled out peg 2 and Glynn was on peg 4, both pegs I would have liked. I stuck my hand in and came back with 19, a peg with some silvers form although it didn’t do very well yesterday. My neighbours for the day were Steve R on peg 21 and Luke G on 17, Mark Leahy was up on 15 and would be fishing for silvers and Roy Hughes was in 23 and would be as well. As I set my box up on the platform, there were quite a few blows down the middle and on the five metre line and I thought we might be in for a good day. I mixed up some more Bait Tech Special ‘G’ Gold before getting the rest of my kit ready. In addition to a 0.4 gram Malman Pencil and a 0.6 gram Drennan G Tip, I also set up a rig to fish banded pellet in the margins for carp if the silvers didn’t want to play ball. Along with the groundbait, I had some soaked micros, 4mm and 6mm expanders plus some 6mm hard pellets. On the whistle I cupped in half a pot of micros on the right hand 10 metre line, two balls of groundbait at the same distance but angled to my left before finishing my initial feeding with half a pot of micros at five metres. I started on the right hand line with a 4mm expander and missed a bite after ten minutes or so and thought I might be in for a better day but it proved to be a false dawn and with no more bites I started to think another grueller was on the cards. Mark Leahy netted a decent crucian and had a couple of carp as well and after around 45 minutes he walked past to get his phone from the car so he could see how his partner Rob was getting on. On his return he said Rob had got off to a great start and had five skimmers already! He also said that John B along from him on peg 12 was catching silvers well. As he went back to his swim, I missed a bite over my groundbait line and with the end of the first hour approaching, I was still blanking! Next chuck the float sailed away and I managed not to miss this one and gently shipped the pole back before slipping the net under a 6oz skimmer – phew! This signalled the start of a really good spell where I had another five skimmers plus a carp and missed a couple of bites before losing a skimmer which I’m sure was foulhooked and the swim went quiet after that. I tried the other ten metre line but no more bites and my next fish was a small blade from over the groundbait so I cupped in another ball plus some micros on the right hand line before trying five metres for the first time to give the longer lines a rest. Steve and Luke both had a couple of carp and Mark was getting the odd skimmer but it looked like he was hooking quite a few carp as well. I had to wait ages for a bite on the short line and then promptly missed it so it was back out over the groundbait line. I was dripping in a few micros via a toss pot on all three lines every time I shipped out. Action wasn’t fast and furious but I added three good skimmers from the groundbait line and was getting quite a few indications, a far cry from yesterday and it just goes to show what a difference a day makes! The skimmers were rough to the touch so they’d either just finished spawning or were about to start. So at the halfway point I’d had ten skimmers for around 8-10lb plus that carp and was doing okay and I hoped Ray was getting some silvers. I did hook what felt like a good skimmer/bream that came off as I was getting ready with the landing net, but I’ll never know for sure as I didn’t see it. I had another brief try on the shorter line with no response. I then had a frustrating half an hour where I missed several bites on the groundbait line and then missed some more over the right hand line (in fact I never had a fish from there all match). I added another skimmer from the left hand line before feeding the two longer lines and trying five metres again. I missed a bite before catching a pound fish that leapt straight out of the water on the strike but the next fish was a carp so I went back on the longer lines but never had another bite from either and with an hour and a bit of the match left and lots of fish blowing on the short line I decided to spend the remaining time there. I had another decent skimmer, my third carp, two smaller skimbobs and I missed a few bites too. Adie called time and my final score was eighteen skimmers plus three carp and I’d really enjoyed it today. I hoped I had 10-12lb of silvers, maybe a little more. 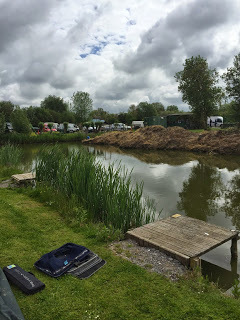 I packed up and Mark wandered down and said he thought he had around 8lb of silvers, after loading the cars we caught up with the scales which had begun weighing in on Longs. The anglers on the early pegs had fished for carp with Mark Cox weighing 14lb 8oz of them and conceding the pound as he only had 1lb 13oz of silvers, Adie Bishop had 18lb 4oz from peg 7 and then young Reece had 20lb 9oz from 11 and Harry M had 15lb 10oz. As the scales reached Ray the top silvers weight was Adie with 5lb 6oz. He had 30lb 13oz of carp before he pulled his silvers net out and went into the lead with 14lb 1oz – well done partner. Nigel only had 5lb 14oz of silvers but he had 34lb 6oz of carp which would be good points with only three left to weigh on the lake. Rob Birch then plonked 14lb 6oz of skimmers on the scales and pushed Ray down a place, Chris B had 13lb 12oz of carp and 11lb 14oz of silvers from peg 32 before Alvin had 39lb 8oz of carp and 11lb 3oz of silvers. Last but not least was Charlie Barnes who had 8lb odd of carp and 4lb 12oz of silvers. Bill was first to weigh on our lake and had 20lb of carp and only a few silvers, then it Glynn’s turn and had 12lb 5oz of carp and 7lb 3oz of silvers and was convinced he’d blown out. Gareth L had 2lb 11oz of carp from peg 6 before Rob Kingston had 30lb 7oz of carp and 5lb 6oz of silvers so I got my pound back from yesterday. John B had 22lb 5oz of carp and a nice net of silvers weighing 14lb 4oz from peg 12, before Mark had 14lb 3oz of carp and 11lb 9oz of silvers. Luke G on 17 had 2lb 2oz of carp and 1lb 5oz of silvers but had lost a few as well. My three carp weighed 10lb 10oz and then I pulled my silvers net out and it didn’t look as much as I thought, I was relieved when the digital display read 15lb 2oz and I went into the silvers lead with two pegs to weigh. Steve on peg 21 had 19lb 8oz of carp before Roy just pipped him with 19lb 10oz of carp and a solitary 7oz skimmer. 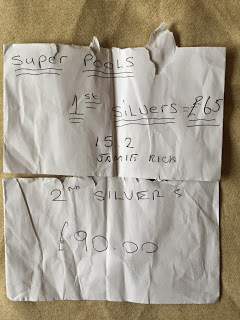 So I’d won the silvers superpool but had me and Ray managed to sneak into the frame overall? With Glynn and Nigel blowing out for silvers, it was going to be tight between us and Rob Birch and Mark Leahy. 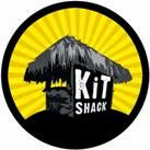 Back in the hut, we all enjoyed coffee, crisps and chocolate while Pete worked out the results. 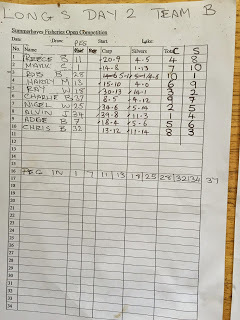 It was, as we suspected, very tight and both pairs tied on 12 points and I knew they’d just pip us on weight which they did with 36lb to our 32lb 4oz. 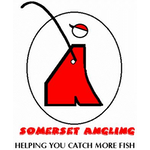 Still we picked up £45 each which was very nice and I also won the silvers superpool which was £65, so £110 and a great days fishing, what a cracking day. I also had £3 in side bets although Glynn wants double or quits next week. Glynn and Nigel actually finished third in the silvers but as they won the carp with 12 points, Roy Hughes and Chris B sneaked in by default. 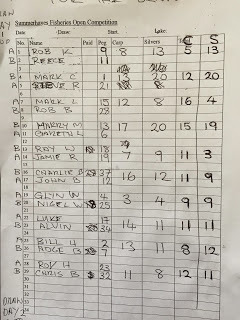 Rob Kingston and Reece finished second in the carp with 13 points and me and Ray ended up third with 18 points which meant Adie Bishop and Bill Hopping picked up by default.